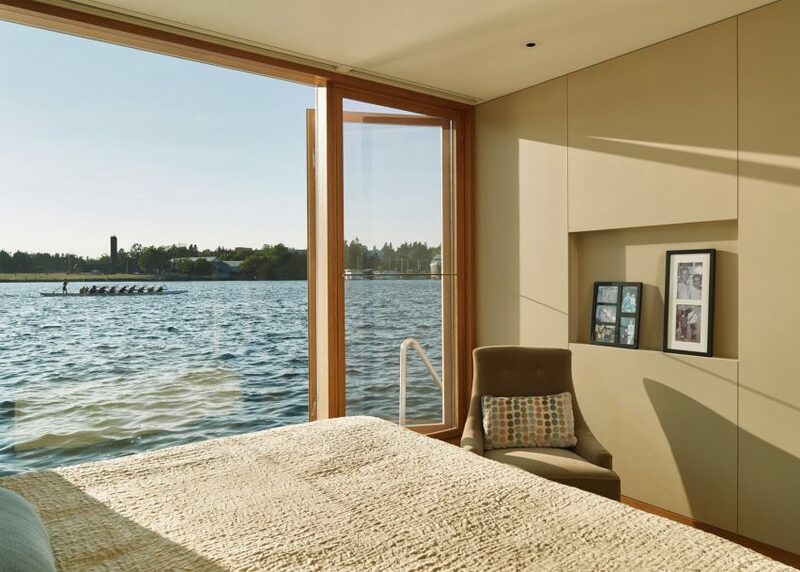 "Float-level" sleeping quarters in this single-family home moored to the shore of Seattle's Lake Union allow residents to go swimming directly from their bedrooms (+ slideshow). 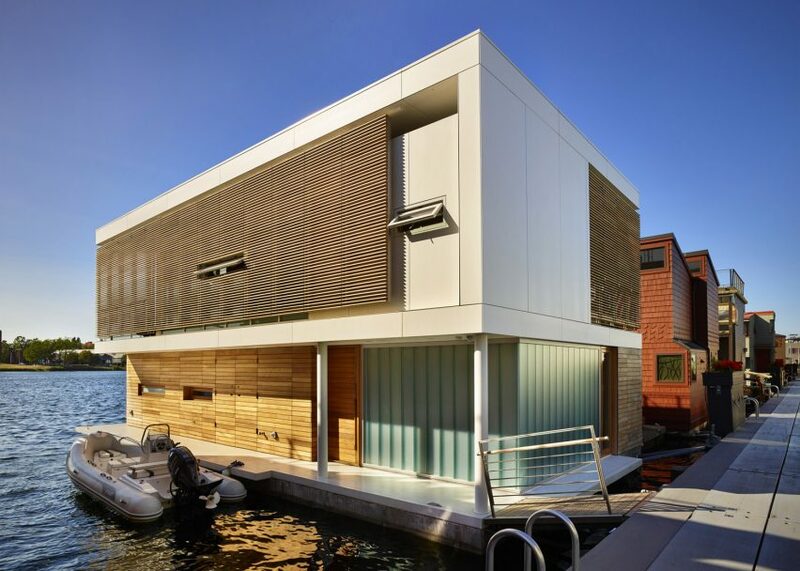 The home was designed by local firm Vandeventer + Carlander Architects, who sought to "continue a long and distinguished history of floating homes in Seattle" with this project. At the clients' request, the residence is flipped upside-down so bedrooms are on the lower level and living spaces are found above – providing better views and lighting for the common areas. The home is accessed via a wooden walkway that runs along the side of the house, where there is room to dock a small boat. 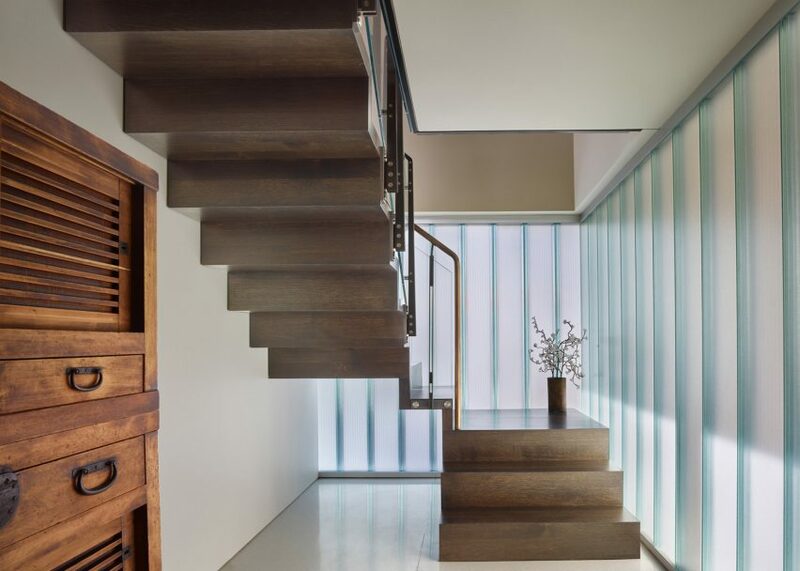 Along this passage, channel glazing provides ample light without compromising privacy. Two bedrooms occupy the lower level, each of them with an en-suite bathroom. A compact cantilevered stairwell leads to the upper floor. 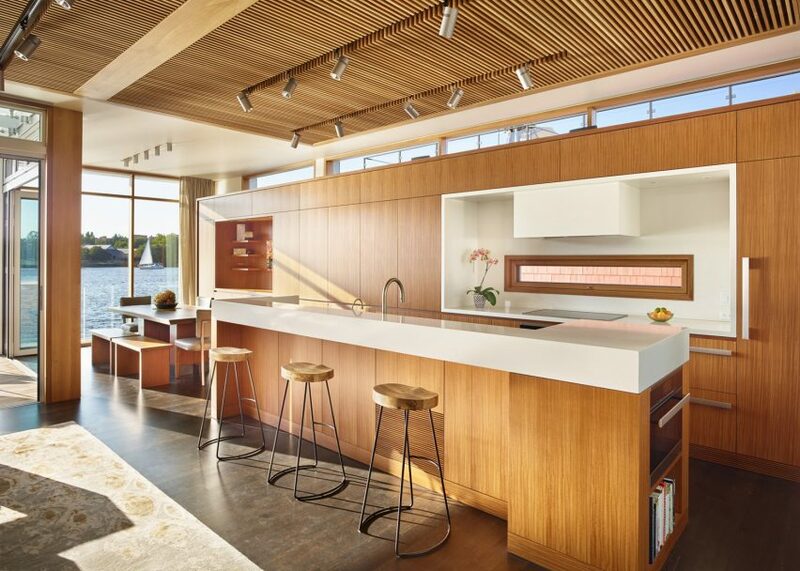 An open-plan kitchen, dining and living room takes up this whole level. Two opposite corners have been carved out of the home's volume to accommodate outdoor spaces. "The east terrace, adjacent to the kitchen, features a small seating area, provides access to a small roof deck, and has a dedicated barbecue area," said the architects. "The west terrace is located adjacent to the living and dining areas; two folding door wall systems allow the terrace to be shared by both." 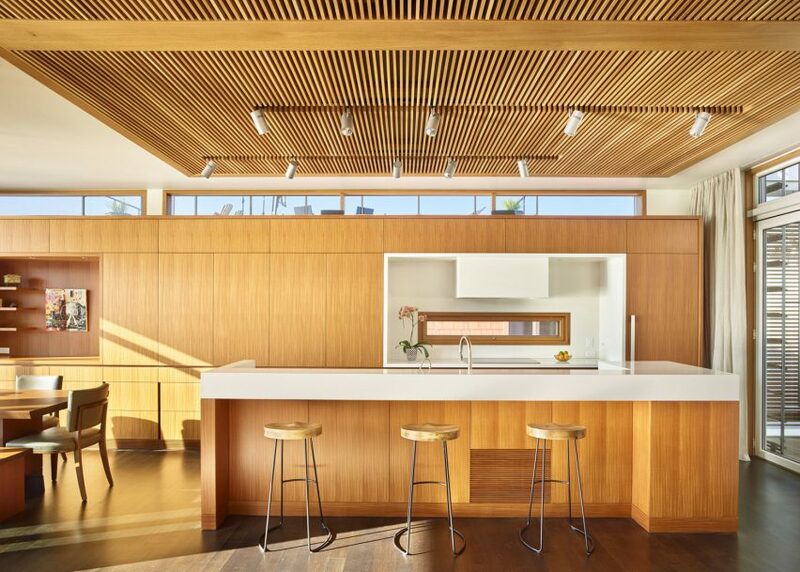 The main living space features a ceiling made up of wooden slats that complement the interior's otherwise muted tones. 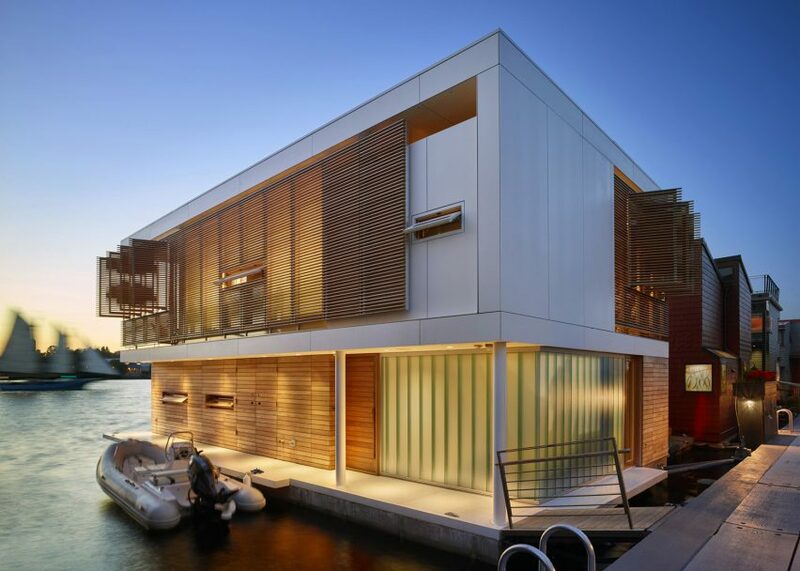 The house is located amongst a series of floating homes moored to a dock. To preserve the residents' privacy, the architects installed a wooden slatted sunscreen on the upper floor's southern facade. The lower level is clad with frosted glass and ceramic panels, while teak wood and ceramic surfaces were chosen for the upper floor. The exotic wood is intended to weather to a "silver-grey" colour. "Exterior materials were chosen for longevity and ease of maintenance," said the studio. Floating architecture is popular on Lake Union, where goCstudio recently completed a floating sauna that allows visitors to jump into the water to cool off. Rising sea levels and a shortage of development sites are leading to a surge of interest in floating buildings, with proposals ranging from mass housing on London's canals to entire amphibious cities in China. Photography is by Benjamin Benschneider.